An utterly charming romantic comedy with Western-genre trappings, A Lady Takes a Chance (1943) is an unjustly underrated film. 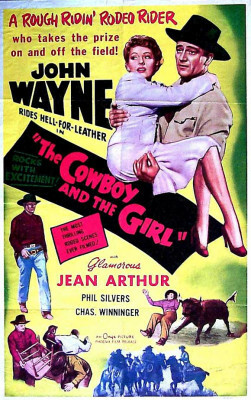 The uniquely talented Jean Arthur stars and the story revolves entirely around her character, but second-billed John Wayne, as her love interest, is delightful as well. John Wayne graduated out of the B-Western grind after starring in John Ford's Stagecoach (1939), but between that film and the icon-making Red River and Fort Apache (both 1948), more often than not Wayne made gaudy potboilers for Republic, his home studio, or was loaned out to the majors where he often played second-fiddle to their big female stars (Marlene Dietrich, Ginger Rogers, Joan Crawford, etc.). A Lady Takes a Chance uses both Arthur and Wayne to perfection. Robert Ardrey's screenplay, from Jo Swerling's story, wisely gives us no backstory on Molly J. Truesdale (Jean Arthur) who, on an apparent whim, decides to take a bus tour from her home in New York City to the American West. Three annoying but persistent suitors (Grant Withers, Grady Sutton, and Hans Conried) see her off. Visiting a rodeo, she's trying to take a photograph when a bucking bronco throws rider Duke Hudkins (John Wayne) into the stands, right on top of her. It's love at first sight. He invites her out for a beer, and after some awkward conversation Duke, obviously nervous, invites a number of less inhibited women friends to join the party. Molly, her feelings hurt, leaves in a huff but Duke follows her and their sweet burgeoning romance begins to blossom. Later, Duke clumsily tries to seduce her after she misses her bus and he offers her his hotel room. She stubbornly decides to hitchhike to the next town to catch the bus, but Duke and his sidekick, Waco (Charles Winninger), wear down her defenses, and the relationship, maybe, is on again. Directed by William A. Seiter, A Lady Takes a Chance is staged unusually well, the actors blocked in such a way to really maximize the film's humor and sweet romance. Even the picture's barroom brawl, already a cliché of Western movies, is done with a lot of imagination and one of the best of its type. The screenplay tells a relatively simple story but does so with enormous charm and wit, tailor-made as it was to Arthur's and Wayne's screen personae. She falls madly in love with the impossibly handsome, appealing Duke. He's instantly attracted to her but, initially, thinks of her as a comely novelty from the usual western gals he normally carouses with. He's a free-spirit, up for anything short of settling down and getting married, while she, wanting to lasso him, tries to play it cool but can't hide her feelings for him. Jean Arthur's husband at the time, Frank Ross, produced A Lady Takes a Chance for release through RKO, and while it's less remembered than Arthur's performances in her Frank Capra films, George Stevens's The More the Merrier and Billy Wilder's great A Foreign Affair, Arthur was never more charming. Winninger is fine, but standing out among the supporting cast is a pre-Bilko Phil Silvers, here playing a garrulous if ingratiating bus tour guide. His glib welcoming of the passengers is like a proto-Bilko monologue. An earlier DVD edition of A Lady Takes a Chance looked pretty awful but the Blu-ray, licensed to Kino from Paramount, is a vast improvement. The film elements sourced appear to be from composite elements, and while short bits and one two or three-minute stretch are in fairly rough shape, most of this black-and-white production looks great. The DTS-HD Master Audio mono (English only) is fine, but there are no subtitle options and no Extra Features on this Region A disc. A real delight, A Lady Takes a Chance is Highly Recommended.